(Kulapae, Waiākea, Hilo, Hawaiʻi) ~ Hui Mālama Loko Iʻa is a growing consortium of fishpond practitioners and stewardship organizations from across Hawai’i. Their mission is to empower a network of kiaʻi loko whose kuleana is to reactivate, restore, and cultivate loko iʻa guided by loko iʻa culture in pursuit of ʻāina momona for ʻohana and communities. In April 2017, over 100 kiaʻi loko and supporters gathered in Keaukaha and Waiākea, Hawaiʻi for the 2017 Annual Gathering. 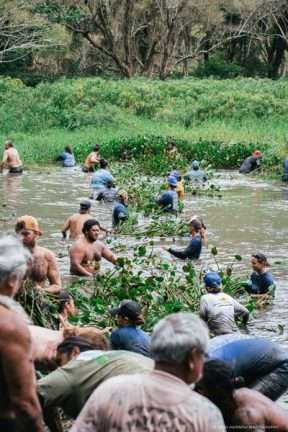 They participated in various workshops and restoration projects hosted by Honokea Loko, with support from Hale o Lono, and Waiāhole fishponds. 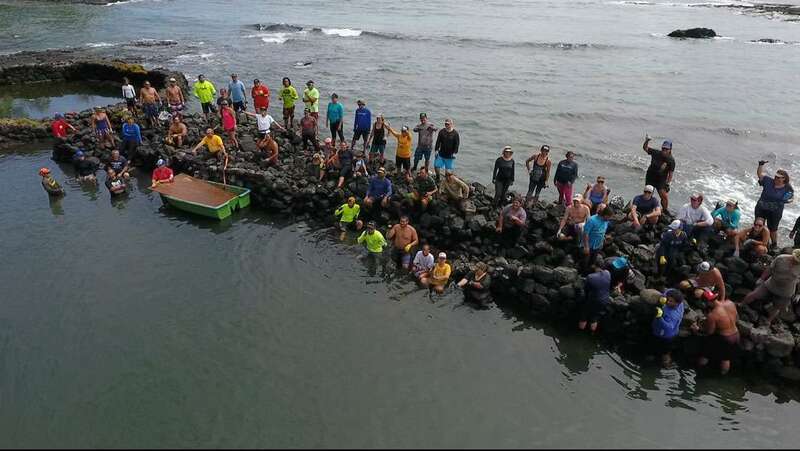 They also took part in a reactivation ceremony at Lālākea fishpond in Waipiʻo Valley on the Hāmākua Coast. Special Mahalo to the host kiaʻi of Hilo, Lālākea Loko Wai Hui, the Hawaiian Cultural Center of Hāmākua, and all the 2017 gathering participants, communities, and ‘ohana of Hui Mālama Loko I‘a for giving your time, manaʻo, energy and commitment. *A version of the below article was first published in the May 2017 issue of Ka Wai Ola under the title “Perpetuating ʻĀina momona through loko iʻa culture.” (Source: KWO, Sept 2017, Vol. 34, No. 5). Loko iʻa (traditional Hawaiian fishponds), provide a viable avenue for growing independent food sustainably in Hawaiʻi and demonstrate the innovation of traditional Native Hawaiian intelligence in resource management as a needed model for future sustainability and food security in ka paeʻāina o Hawaiʻi. 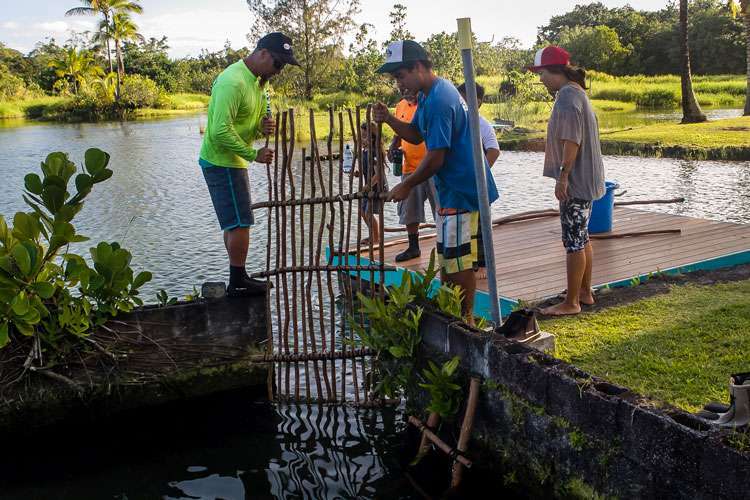 Thanks to a dedicated group of kiaʻi loko (fishpond guardians) on a mission to reactivate, restore and cultivate loko iʻa culture, Hawaiʻi’s fishponds are on a path to restoration. Loko iʻa are impressive structures. They represent one of the world’s most significant and successful aquacultural achievements. Reflections of the art of Native Hawaiian resource management practices, this system is self-sustaining and can maintain fish stocks in perpetuity if properly managed. 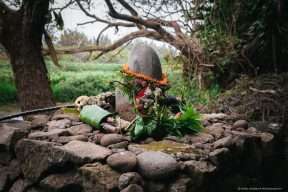 Loko iʻa are also ancestral places of importance and significant Wahi Pana to Hawaiians. These Wahi Pana are associated with revered deities, cultural practices and many historical events. As key features within an ahupuaʻa system where water flowed freely mauka to makai (from the mountains to the sea) loko iʻa provided aquatic food resources like native fish and limu that not too long ago helped sustain communities throughout Hawaiʻi. Over time, loko iʻa have taken on an unprecedented amount of stress due to surrounding development, natural disasters, mismanagement of resources and lack of continuous stewardship. In 1901, J.H. Cobb estimated that about 360 fishponds were once in operation in Hawaiʻi. 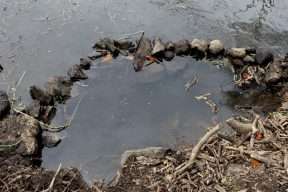 While the remains of many of those fishponds have been lost, many of those left today can be restored as productive food systems for surrounding communities. Newly restored loko iʻa can also provide employment, economic opportunity, fish stock and near shore fishery enhancement. 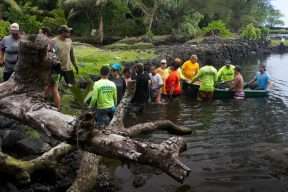 As one of several examples of mālama honua (caring for island earth), fishponds also offer educational opportunities and promote the sharing of cultural values. Located where the land meets the sea, loko iʻa are incredible indicators of the health of an ahupuaʻa system. 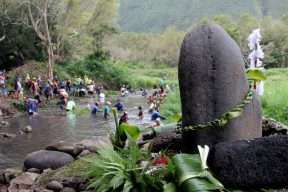 Based on their proximity to the shoreline and streams, loko iʻa become the catch basin of many nutrients and pollutants, organic and inorganic, which has caused contemporary practitioners and researchers to take a much closer look at the health of the water flowing in and out of the fishpond. Phytoplankton are the basic foundation of life contributing to almost all larval animals not only within the waterway and estuary but also for the near shore fisheries. Phytoplankton are microscopic marine plants created naturally by the mixing of fresh and saltwater sources, referred to by fishpond practitioners as waikai (brackish water). By design, internal water levels within loko iʻa adjust with the ebb and flow of corresponding tides. On the outgoing tide, phytoplankton created from the mixing of waikai ends up flowing into the near shore fisheries providing a source of food for fish (and other various larval species) residing in the area. The ingenuity of the traditional Hawaiian fishpond is that with this free flowing waikai, a kuapā (rock wall), and a mākāhā (sluice gate) system, an endless food “buffet line” is created for fish consumption. In addition, and perhaps most remarkably, an entire ecosystem ends up being supported by this food web that includes fish, limu, crabs, and other native birds.This prolific system has the potential to become a living refrigerator for communities to independently raise healthy seafood naturally. Since the availability of abundant, clean freshwater directly correlates to the health of the near shore resources and the quality of food fishponds can provide for surrounding communities, restoring and maintaining the health of loko iʻa around ka paeʻāina o Hawaiʻi is imperative. Kaiāulu Hanakahi. The community who works together. The morning of April 6, 2017, was warm but refreshing as a clever breeze cooled the campsite at Kulapai on the coast of Waiākea, Hilo, moku o Keawe. While the day was greeted and the scene prepared, kūpuna, keiki and kiaʻi loko (the contemporary guardians of loko iʻa) from across ka paeʻāina o Hawaiʻi were welcomed for the annual convening of Hui Mālama Loko Iʻa. 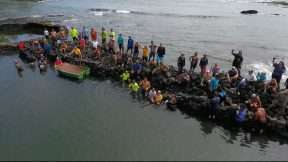 “Through this hui these fishpond kiaʻi demonstrate their strength as a community of practitioners. Gathering helps them to empower and lift each other up in the service of a shared purpose, to share lessons learned and improve efforts across the paeʻāina in service of a shared vision of abundance for Hawaiʻi,” said Kevin Chang, Executive Director of Kuaʻāina Ulu ʻAuamo (KUA), the local nonprofit that has facilitated the network since 2013 and provided the primary logistical support for the four-day gathering. Provisioned by this year’s hosts from Hui Hoʻolei Maluō, Hale o Lono and Kumuola Science Education Center, the theme of the 2017 Hui Mālama Loko Iʻa Gathering was Kaiāulu Hanakahi. Having multiple meanings, connected to various moʻolelo, Kaiāulu Hanakahi translates mainly as the community who works together. Instinctively, Kaiāulu Hanakahi permeated the weekend activities prepared by HMLI organizers; the conversations and small group discussions, the hana (work) at Honokea, Waiʻāhole and Hale o Lono fishponds in Waiākea, and the successful reactivation of Lālākea Loko Iʻa in Waipio Valley on the Hamakua Coast. 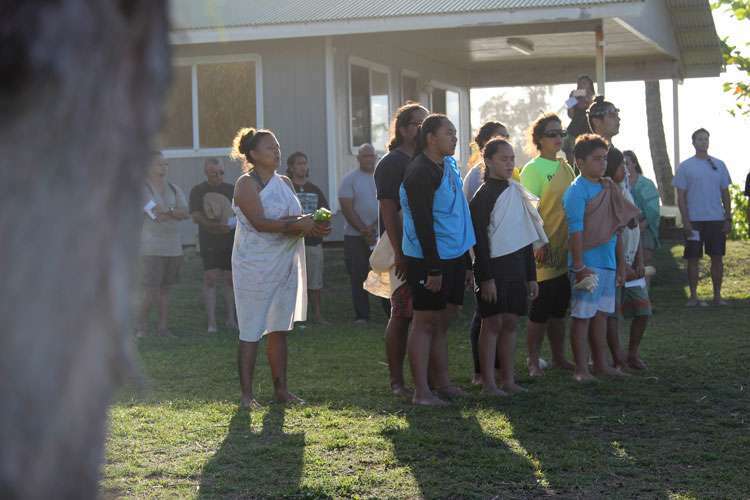 The momentum of Kaiāulu Hanakahi and their collective work in Waiākea stayed with these kiaʻi as they left for their respective places on the last day of the gathering. It is most embodied in the focused and dignified work of a collective lāhui who are moving their community forward together with a renewed sense of strength and fortitude. Make the oven ready, wrap the fish in ti leaves to be cooked. Meaning: All preparations have been made; now let us proceed with the work. Tasha Stiritz is a member of Hui Mālama Loko Iʻa who focuses on aquaculture and communications at Mālama Loko Ea in Kawailoa of Waialua, Oʻahu. This entry was posted in Gatherings, Hui Mālama Loko I'a and tagged Gatherings, Hui Malama Loko Ia. Bookmark the permalink.